The toddler stage is a particularly challenging one from a feeding perspective. Once your little one begins to eat solid food, and his main nutritional source is no longer breastmilk or formula, many parents begin to panic. Is he eating enough? Am I introducing enough variety? Why is he so picky? Making sure your child is eating enough foods and is eating the right foods can be tricky for many parents. 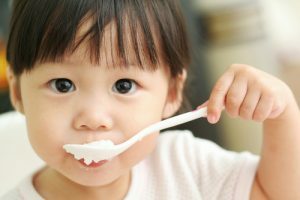 The American Academy of Pediatrics (AAP) recently came out with new toddler feeding guidelines which may assuage some parents fears and educate moms and dads on what to feed their little ones. First, if you’re worried that your child isn’t eating enough, the AAP says that while children rapidly develop in their first year of life, after the age of one, their development continues at a slower pace, and they don’t need an excessive amount of food. According to the AAP, between the ages of 1 and 3, children need 40 calories per inch of height. Most toddlers, according to that guideline, need between 1000 and 1500 calories per day. Since most children eat three meals and two snacks each day, even if their portions are small, that calorie count isn’t too difficult to reach. servings, or 75 calories, of vegetables, per day. 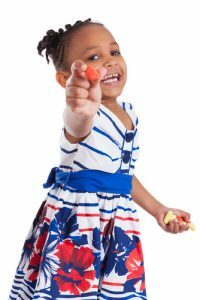 This may seem a little more difficult, but trying a variety of different veggies will help you to determine which ones your toddler will eat, and which ones are unwelcome. Fruit is a bit easier to work in, and the AAP recommends 2 to 3 servings, or 75 calories, which shouldn’t be difficult for all of the strawberry, blueberry, apple, and banana lovers out there. The AAP suggests 2 to 3 servings of dairy, or 300 to 450 calories per day. Many kids are milk drinkers and quite a few love yogurt and cheese, and since dairy is highly caloric, most kids are getting their fill. Children should receive 2 servings of protein per day, or 200 calories. If your child loves chicken or fish, you’ve probably nailed this one. Legumes are also recommended at 2 servings or 200 calories per day. If you’re having trouble getting your child to try beans or lentils, pureeing them into a soup can be an easy fix. For kids without peanut allergies, one tablespoon of peanut butter is recommended daily as well. These guidelines are not hard and fast, and if your toddler swears off veggies for a short while or goes on a yogurt strike, don’t panic. As long as they are eating from several of these food groups throughout each day, they are likely getting what they need. These new guidelines offer a great reference when you’re planning your toddler’s meals throughout the week!